Joe Biden 2016: How the vice president could make things awkward for Hillary Clinton. 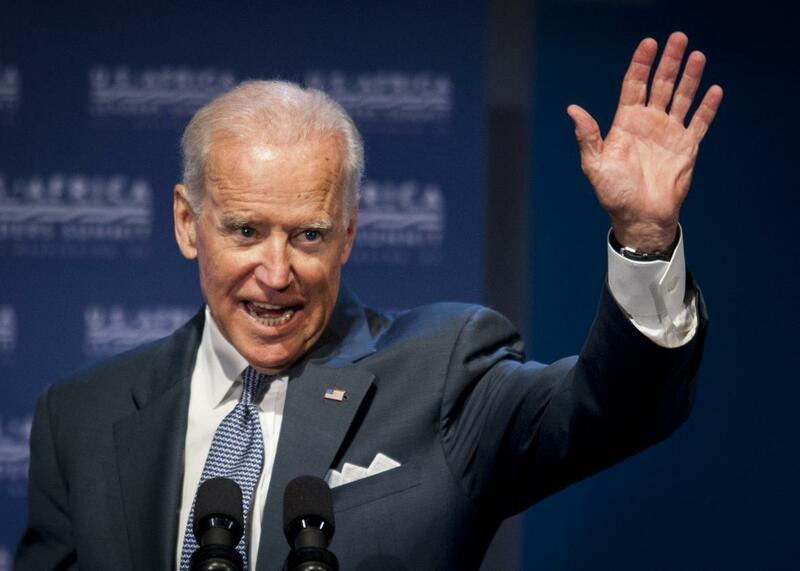 Vice President Biden speaks at the Civil Society Forum on Aug. 4, 2014, in Washington, D.C.
New York Times columnist Maureen Dowd set the Beltway atwitter this weekend when she reported that Joe Biden was seriously considering running for president in 2016. The revelation that the vice president’s late son, Beau, had urged his father to make another White House bid was more than a month old, but Dowd’s intimate description—“Beau was losing his nouns and the right side of his face was partially paralyzed”—was enough to breathe fresh life into the speculation. The non-opining political press quickly worked its sources and confirmed that, in the Associated Press’s words, “Biden’s associates have resumed discussions” about a run and that the veep could make a final decision early next month. We don’t know what Biden will ultimately decide—and there’s good reason to assume he’ll say no after all—but what we do know is that, if he jumps into the race, he’ll have his work cut out for him. Hillary Clinton has been routinely battered by bad press this year but she remains incredibly popular with Democrats, many of whom would love to elect the first female U.S. president. She also has a massive head start in fundraising, organizing, endorsements, and pretty much any other campaign category you can imagine. It’s conceivable that the buzz Biden’s late entry would generate would help him close some of those gaps, but Clinton would remain the odds-on favorite to be the one accepting her party’s nomination in Philadelphia next summer. Setting aside whether Biden could win the nomination, though, it’s worth considering just how much he would fundamentally alter the Democratic race just by entering it. (And if you think it’s way too early for this type of speculation—well, there’s a browser extension for that.) Liberals who have been desperate for an Anybody-But-Clinton(-As-Long-As-We-Can-Still-Win) candidate would finally have someone to get excited about. Media outlets that would prefer the drama of a contested primary to the boredom of a coronation—read: all of them—would provide Biden’s campaign with all the attention he could ever want. And his presence on the debate stage this fall would likely change a Hillary vs. the Field sparring round into a head-to-head slugfest between two bold-faced names in the Democratic Party. More importantly, Biden’s entry could force Clinton to pick a lane. To date, the former secretary of state has been able to be two things to two sets of voters: to mainstream Democrats and left-leaning independents, she is promising a third Obama term; to progressives with one foot in the party and one out of it, she is promising a more liberal administration than the current one. Without Biden, then, Clinton has laid claim to pretty much the entire liberal landscape, save the sliver being held down by Bernie Sanders. With Biden, though, she’d have to cede ground somewhere—or risk watching Biden take it—although it’s unclear where she’d want to land. As I’ve explained before, Clinton has already moved left further and faster than almost anyone had expected. But her leftward shifts on criminal justice, immigration, and other issues were largely by her own choosing, and the moves have been safe: While most of her chosen causes are progressive in nature, they also poll relatively well across the political spectrum. It’s unclear how much further she’d be willing to go. And even if she were to try, she’d no doubt have a difficult time convincing already skeptical progressives who have long distrusted her Wall Street ties and her husband’s history of triangulation. Still, she might have to, because simply promising another Obama term becomes its own awkward proposition if BFD Biden is in the race. As the sitting vice president, he would have a much easier time presenting himself as Obama’s obvious successor. For the past six years, he’s been the president’s right-hand man—sometimes quite literally—on everything from Iran to gun control to Obamacare. And on those rare occasions he (accidentally) broke with his boss, it turned out for the best. Still, while Biden’s long been a happy warrior, he hasn’t exactly been the best one on the national stage. The same gaffe-filled authenticity that has seemed quaint the past half-decade would be a liability on the campaign trail—even in a year when voters have shown a real hunger for less polished candidates. His 1988 presidential bid didn’t even last to the end of 1987, and his 2008 run ended shortly after a lackluster showing in Iowa. If Biden runs in 2016, it will probably matter less for him than it will for Hillary Clinton.